My March bag from Nail Art Society arrived yesterday! 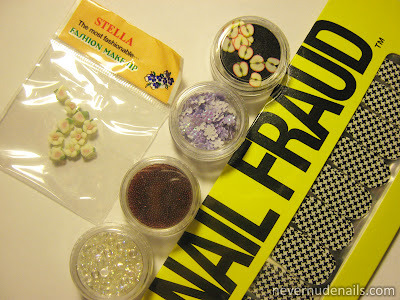 I took advantage of the $10 off deal from Pure Ice so that I could get a Nail Art Society bag for $9.95 per month. This is my second bag. I was worried that it wasn't coming this month since I never received a tracking number so it was a nice surprise and a relief when it showed up. It was addressed to the wrong person though, hmm. I wonder if Elizabeth G. got my name on hers. 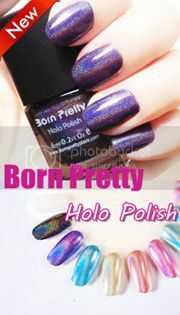 I'm a bit disappointed that there's no actual nail polish this month. But at the same time, I'm happy to get some nail art supplies that I wouldn't necessarily buy myself. There's polish strips from Nail Fraud in my least favorite pattern ever! I don't know what it is about houndstooth but I hate it. Always have. There are four pots of nail decorations: bubbles, caviar beads, purple flowers, and apples! Also, some 3D flowers by Stella that remind me of cake decorations. I'm most excited about the bubbles and apples. I'll be trying out some of these things soon! About this Google Reader business... I don't know what it means for Google Friend Connect (hopefully, NOTHING) but just in case, check out and sign this petition urging Google not to kill Google Reader. There are over 85,000 signatures as of my writing this up. I don't know about you but the way Google kills off services does not help my confidence in using their services. Why start using it if they're going to kill it off randomly? Not cool. You can follow my blog using Bloglovin' and Hellocotton under "other ways to follow" on my sidebar. Oh wow! Can't wait to see what you do with them! Problem with decors for me is that I pick them off when I have a moment to myself. Are those caviar beads brown? I've never seen them in that colour!